On March 22, 2018, the Nevada Gaming Commission held a hearing to determine whether Joseph Whit Moody (shown at right) will become the 32nd person to have the dubious honor of being included in Nevada's infamous "Black Book", the List of Excluded Persons. To my knowledge, if added, he will be the first to be added due to a TITO (ticket in / ticket out) related crime. More accurately, Moody would distract guests, generally elderly women, at ticket redemption kiosks or ATMs, and steal their cash as it came out of the dispenser. He got away with this scam for some time because seldom would a tourist to Las Vegas want to return to the state to testify in a criminal trial. However, his inclusion in "the book" would assure that he'll be removed from any casino he tries to visit in the future. While not officially sanctioned, anyone in Nevada's Black Book is pretty much banned in casinos across the country. While IGT has grown through the years into the slot and lottery giant it is today, it has battled competition in all its product categories - with the one notable exception of the category that launched the company all those years ago. IGT still defines the video poker product genre. It commands more than 90 percent of the worldwide market. The best approach to almost any new topic is to get a few good books on the subject, study them, and then practice, practice, practice. Unfortunately, if the subject is slot analytics, you'd strike out at step one, since there were no good books on the subject until this one. Most of you have probably read Casino Operations Management by Kilby, Fox & Lucas. It's a classic that's been around since 1998 and has been revised a few times, most recently in 2011, and you should read it, particularly if you're new to casinos. 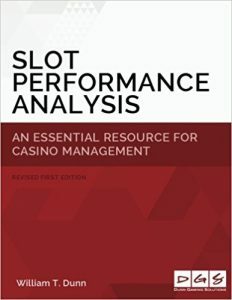 However, the chapters on slots and analytics are basic, at best, in terms of evaluating your slot floor mix. There are also several good books on slot and gaming math, among them: Casino Math by Hanum & Cabot, Probability Guide to Gambling by Barboianu, The Mathematics of Games by Taylor and the Mathematics of Games and Gambling by Packel. I like the Casino Math book best from these, as the others concentrate more on table games and/or mathematics. They are all recommended. But again, none of these offer much help in making your slot floor better and more profitable. The Southern Gaming Summit is the premier casino industry conference and convention for the South-a can't-miss event for operators and anyone who wants to do business in this region. From Texas to Florida, SGS 2018 covers the issues that matter to gaming operators and suppliers. Founded in 1994, SGS has a long history of business development in the region, whether it's commercial casinos, tribal gaming, community gaming or iGaming. The Japan Gaming Congress is a two-day educational forum that will offer a clear, practical insight and understanding into the casino legislation in Japan. With a relatively short time to go before the first licences are issued now is the time to fully understand the potential complex nature of IR Casinos in one of the potential superpowers in Asia. The marketplace for the Asian gaming industry, Global Gaming Expo Asia (G2E Asia) is renowned as a key gaming and entertainment business hub across the continent. It is the must attend marketplace for the Asian gaming industry, offering a one-stop platform to the industry professionals to network, forge fresh connections, source new products and solutions, and gain a deeper insight into the latest global industry trends. Every year, over 95% of Asian casino operators attend G2E Asia to look for cutting-edge products and solutions and gather upcoming industry trends. Data analytics is both a science and an art. While millions of bits of data are available to casino operators each day, the way they apply that information varies widely. Effectively interpreting the numbers can mean the difference between success and failure. Episode III of the UNLV Gaming & Hospitality Education Series focuses on those numbers and how to drill down to find the best and most efficient usage, providing operations with the tools to deliver revenue and excellent customer service at the same time.